FIFA 15 new season has a new makeover it looks like FIFA 16 everything has been change from the game logo to the packing opening animations the colours look vibrant the animations are very smooth the new player cards look like FIFA 16 on consoles When I first saw the new season I Ford it was FIFA 16 for Android EA has done great job on the game. But when FIFA 16 came out on android it looks likes a hold new game and that's what we want. The colours looked nice not amazing the game was new but it didn't look new the game looked kind of rush the player cards look old and the pack animation just show your highest rated player and that's it. so FIFA 16 mobile even do is a new game i feel like EA just rush it on look and design but I can understand that because they were on also FIFA 15 NEW SEASON but I hope that EA updated FIFA 16 mobile late in the year. In FIFA 15 NEW SEASON there isn't anything you haven't see before the only new featured would be the single player tournament. The new season only brings a new season new interface, new kits, new boots, new transfer players from 2015/2016 some bugs fixes and a more stable gameplay. Overall in terms of features their isn't anything new. In FIFA 16 MOBILE you are introduced a hold lot of features the biggest is now in FIFA 16 mobile you will be able to play online season after so long EA has finally brought online season to android but the featured am most existed for is now on FIFA 16 mobile you will be able to play with an xbox or PS controller. In FIFA 16 mobile EA has brought a feature call PLAYER EXCHANGE you pretty much trade the players or items you don't need any more for a change of getting a player you need or a high rated player. And also single player tournament FIFA 16 MOBILE brought a tons of new features and EA say that their will updated the game every 8 weeks so we might see even more new features. FIFA 15 NEW SEASON has a smooth gameplay everything runs nice and smooth if you played the before is pretty much the same there hasn't been a bing change the players are the same and the graphics so really on gameplay side nothing has been change. In FIFA 16 MOBILE there is a new engine which the game runs on the gameplay is extremely smooth the graphics are stunning the players looks amazing the game feels every balanced. When you scored you will be able to do celebrations the game feels like on consoles it is just very very good the new engine runs every smooth. Overall the Fifa 16 has a better gameplay better graphics more control and everything is just well balanced EA has done a great job on the gameplay. It definitely beat FIFA 15 new season. I have play on bought of these two games and I can tell that right FIFA 15 UT NEW SEASON has a better experience than FIFA 16 UT. On FIFA 16 the are lots of bugs you will experience some lag the interface is not very responsive it take time for the items to load the game crashed multiple times I don't experience these kind of issues on FIFA 15 UT. FIFA 15 is very responsive the interface looks great all the animation runs great the game feel clean I don't experience Any bugs overall the game is well built. OK here my conclusion FIFA 16 UT it is a good game is not great the graphics are stunning the gameplay extremely well there are lots of new features but the game feels like in beta the interface is laggy their are lots of bugs the game crash couple of times on me I was playing the game on my oneplus one and I hope EA fixes lot these issue. FIFA 15 UT NEW SEASON is a great game it doesn't many bugs and issue has a smooth interface the gameplays fine everything runs fine it doesn't lag it looks great. 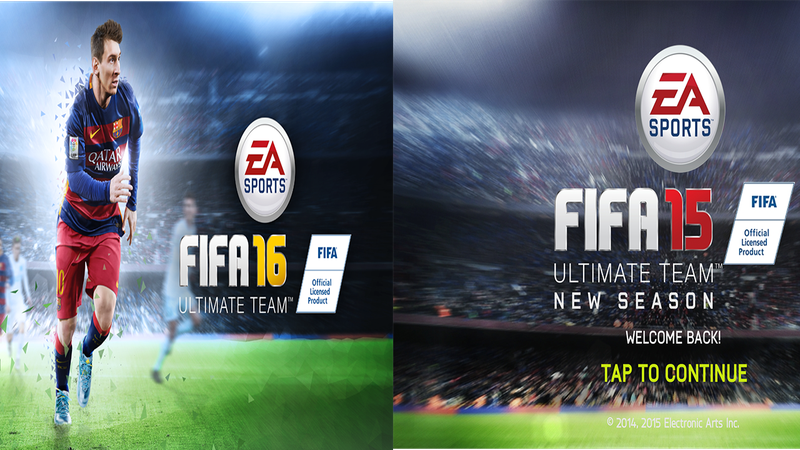 If you don’t like lag, you want a smooth interface, good gameplay than FIFA 15 UT NEW SEASON is a great game to play. but if you want a the new feature, amazing graphics, great play and you don’t mind some lag than FIFA 16 UT is for you. what do you guys think of these two games if you have any question or opinion please leave it in the comments below. Server responsed at: 04/25/2019 6:26 p.m.